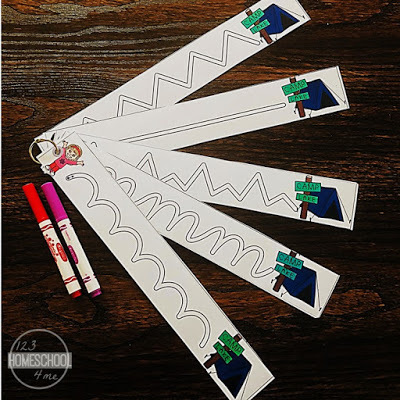 Kids will have fun strengthening their fine motor skills so they are reading to start writing letters after practicing with these super cute camping themed tracing strips perfect for toddler, preschool, and kindergarten age kids. Print as many sets as you need for the number of groups in your class. If you are using these in a center, it’s a great idea if you have an extra set just in case you want another group to get started on the activity. There are 10 strips (5 on each mat if using on a mat) in total. 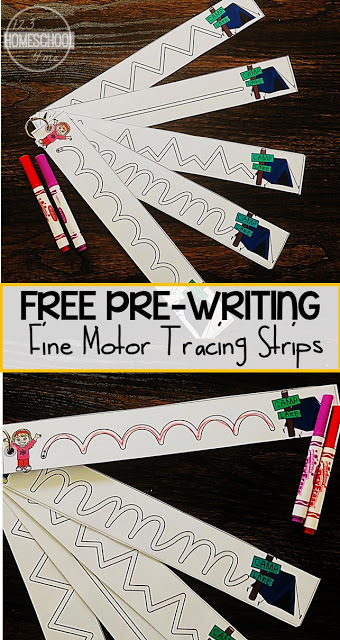 Need your preschool kids to practice their fine motor and pre-writing skills? Laminate these mats and store them in your fine motor centers for a quick and easy pull out and use activity. After you’ve laminated the mats, you can choose to cut each mat into strips or simply use them each as a mat. 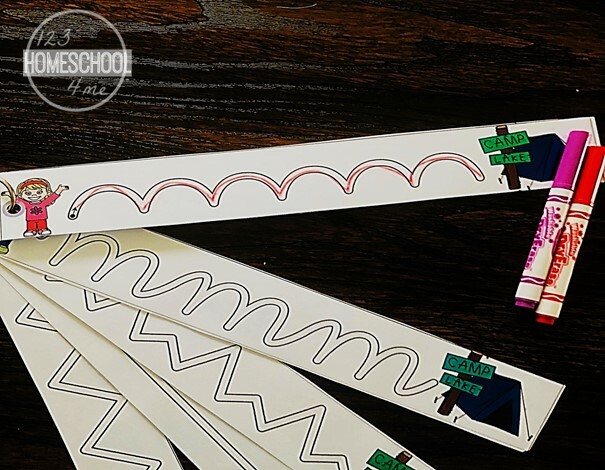 I think it’s a good idea to laminate and cut up the strips so that you can differentiate the activity with kids just starting to work on their pre-writing skills. Have the kids use a dry erase marker to trace each line to help the camper get to the tent. The kids should not veer too far away from the line, just have them repeat the activity at a later stage until they perfect this skill.